SENSOREE is excited to be included in the Body of Matter – Body based bio art & design exhibit. Bio-elektrische is our newest work commissioned by MU Artspace. For the grant, we were paired with a Loe Fiejs, a scientist at Designed Intelligence TU Eindhoven. Body of Matter presents the work of ten artists that advance our ideas about the body. They explore its materiality, stimulation, quantification using technology, integration with alien matter, and, finally, its obsolescence by simulation. The artists here expand our collective knowledge of the body both by creating sensorial experiences for visitors and tapping into the hugely expanded science of the body through fields such as Microbiology, Neuroscience, Genomics, and tissue culturing. The starting point for this work is observing how people report feeling something when another person thinks about them. This can be the chill of goosebumps, a presence like a hand on the back, tingles up the spine, or heat in the ears. These are associated with a heightened state of the Sympathetic Nervous System (SNS) in which heart rate increases, temperature rises, muscles tighten, and hair stands up on end. This project sets out to stimulate these sensations with inflatable biometric wearables linked between two participants. Once the first participant thinks of the other, their SNS is naturally stimulated, which is detected by the wearables and transmitted to the second participant. This second participant feels the artificial stimulation of the wearable, through components like animatronic fur. The second participant is then able to send tactile feedback, a signal of acknowledgment to the first participant. This signal-strengthening loop has the potential to prompt emotional states or sensations newly mediated by technology, and never-before experienced. 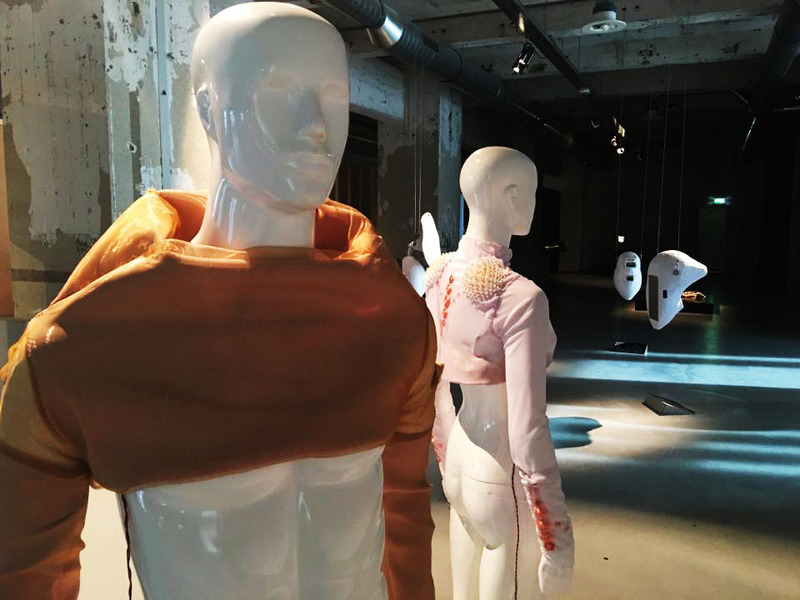 The two integrated, wearable, 3D print and haptic fabric designs enhance and repattern sensation and communication between two people remotely. As the artist summarizes, bio-elektrische is an exploration of “body awareness, enhanced touch, and remote communication, blended with new manufacturing technology, robotics, and future fashion.” The work both simulates and amplifies mechanisms of the body to reshape social connectivity and adds dimensions to the idea of remote feeling.